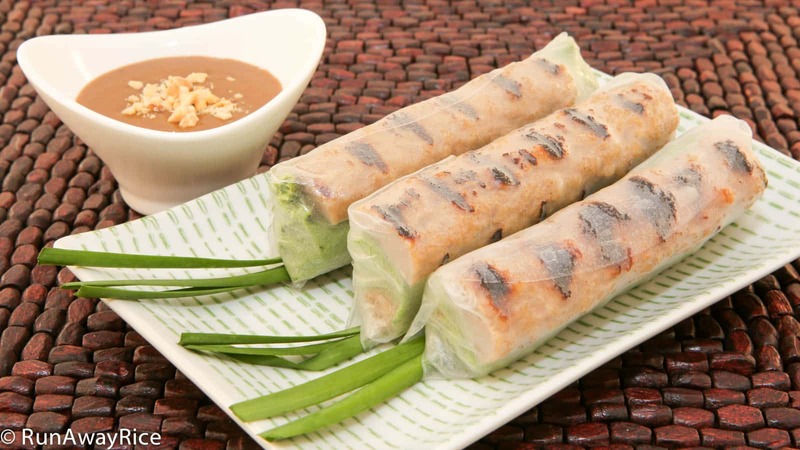 I admit it–I’ll eat anything rolled in rice paper. My all-time favorite dish is Pork and Shrimp Fresh Spring Rolls (Goi Cuon) and on its heels is this dish. I absolutely love all the different tastes and textures of these unique spring rolls: the flavorful and hearty grilled pork sausages, the refreshing lettuce and aromatic herbs, the crunchy cucumbers and the crispy egg roll wrapper is pure genius! Then there’s the slightly chewy and sticky texture of the rice paper encasing all of this goodness. Add the dipping sauce and you have sensory overload in the most mouth-watering way. Who doesn’t love this dish! Feel free to adjust the sweetness of the dipping sauce to your taste. If you prefer a sweeter sauce, use 1/2 cup honey instead of the recommended 1/3 cup. If you’ve had this sauce in the restaurants, it’s definitely on the sweeter side. These rolls are best when they are freshly made. The rice paper doesn’t refrigerate or reheat very well. If you’re making these ahead to serve later, cover the rolls with a damp paper towel to keep the rice paper moist. If you enjoyed this recipe, you may also like: So Simple Spring Rolls (Goi Cuon) and Fresh Spring Rolls with Chinese Sausage (Bo Bia). Peel the garlic and shallots and chop. Heat a saucepan over High heat and when hot add the vegetable oil. Add the garlic and shallots and stir-fry for 15 seconds. Reduce heat to Medium. Add pork and cook for 6-7 minutes or until thoroughly cooked. Add the black bean soy sauce, hoisin sauce, honey, sweet vinegar, peanut butter, coconut soda, roasted rice powder, tapioca starch and ground black pepper. Stir together and combine well. As soon as the sauce starts to bubble, turn off the heat and allow to cook for 10 minutes. Pour sauce into a blender and process for 1 minute until smooth. Serve the sauce warm topped with the crushed peanuts. In a small bowl lightly beat the egg with a fork. Separate the egg roll wrappers. Take one of the wrappers and lightly brush it with the egg mixture. Roll the egg roll wrapper up into a tight log. Brush a bit more of the egg wash on the edges to seal. Deep fry the egg roll wrappers in vegetable oil for 5 minutes until golden brown. Place the rolls on a paper towel to soak up the oil and allow to cool. Alternatively, place the egg roll wrappers on an oiled baking sheet. Spray some vegetable oil on the rolls. Bake at 425 degrees Fahrenheit for 12 minutes. Rotate after 6 minutes so they brown evenly. Remove from oven and allow to cool. Cut each of the pork sausages in half and then cut in half lengthwise so there’s a total of 16 pieces. Prepare a plate of fresh greens consisting of green leaf lettuce, fresh herbs, cucumber strips and garlic chives. Dip a sheet of the rice paper in the water wetting it completely. Shake off the excess water and place the rice paper on your work surface. Wait for 10 seconds to allow it to soften. Place a piece of green leaf lettuce on top of the rice paper. Place a cucumber strip and an egg roll wrapper on top of the lettuce. Wrap the lettuce around everything making a tight roll. Wrap the rice paper around the lettuce log and roll about halfway. Place a piece of the sausage next to the lettuce log. Roll again covering the sausage with the rice paper. Fold over each of the ends. Place a sprig of chive on the rice paper and then finish rolling. Continue until all rolls are made. 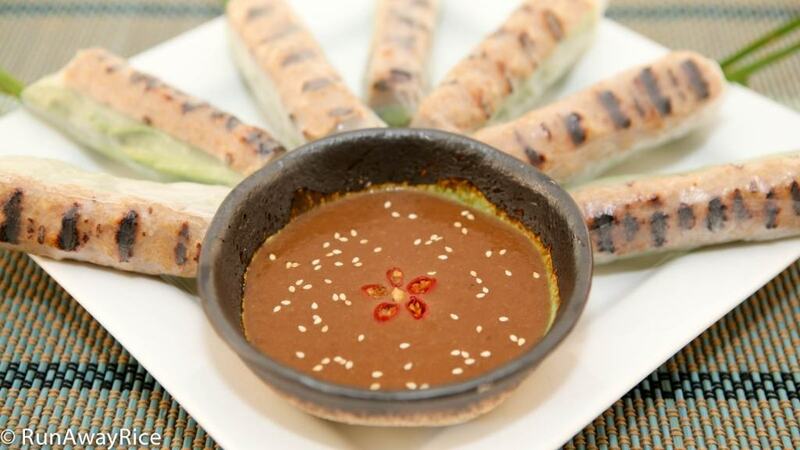 Serve the fresh rolls with the warm dipping sauce. Enjoy! Hi, I’ve never tasted black bean soy sauce. Is there any differences to regular soy sauce tastewise, and can I sub the bean sauce for regular soy sauce? Black bean soy sauce has a stronger flavor than regular soy sauce and is thicker. If you don’t have the black bean soy sauce, you can substitute with soy sauce but the consistency will be looser. Good Luck! I was just wondering for your thit heo quay recipe can you still broil in a gas oven? Yes, you can broil in a gas oven. That’s what I use. Good Luck! K rất thích cách Trang hướng dẫn, rõ ràng dễ hiểu. Cám ơn Trang rất nhiều và chúc Trang luôn An Lành, Hạnh Phúc, Thành Công như ý.
Cám ơn Chị đã ghé website và để lại những ý nghĩ đẹp. Mong bạn thường ghé luôn nhé. Chúc Chị luôn vui, khoẻ và bình an. One of my favorite Spring Rolls! Spring Rolls are my absolute favorite item to get. I always get either one or two orders when I visit the restaurant! If I go to a place that has both shrimp and pork and the nem nuoug ones I try to get one order of each! I’ll give the sausage recipe and this one a try a week from now because I’ll be on vacation then. I’m sure it’ll be excellent! I finally invested in a little food chopper. An Oster 3-cup mini chopper. I used to to mince some fresh ginger for a different recipe that also had me use it to whisk an egg white with sherry and corn starch to marinade some chicken. Turned out ok! I know I’ll use it in the future on some more of your fine recipes! It will make things much easier! Keep up the great work! I’ll let you know how it goes next week as well as a pic of the sausages and the spring rolls! I am glad to hear you’ll give this recipe a try. You won’t be disappointed! I can never can my fill of these delicious spring rolls at the restaurants. Making it at home means you’ll have more than you can eat. Enjoy! A mini food chopper is a great time-saver. I use mine quite a bit as you can see from my videos. Thanks for visiting and looking forward to seeing pics of your spring rolls. Thank you Trang đã chia sẽ , rất ngon và lại dễ làm nữa. Chúc Chị một ngày thật vui!